Determined to make my own version of Buried Treasure, I doubled up on sorbets last week. 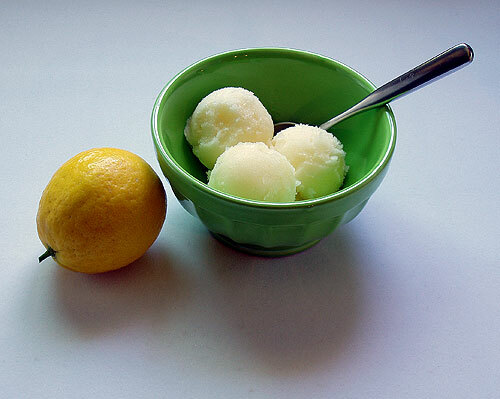 I followed up a fantastic blackberry sorbet with this recipe for lemon sorbet. Both recipes come from David Lebovitz’s book, The Perfect Scoop. I was a little unsure of this recipe at first, given that my other recipe for Meyer Lemon Sorbet just about reverses the water to lemon juice ratio. How would this recipe with half as much lemon juice fair? 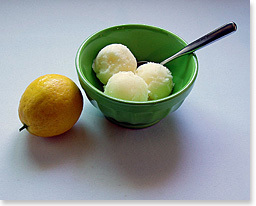 To my surprise, this sorbet was just fine with only 1 cup of lemon juice. 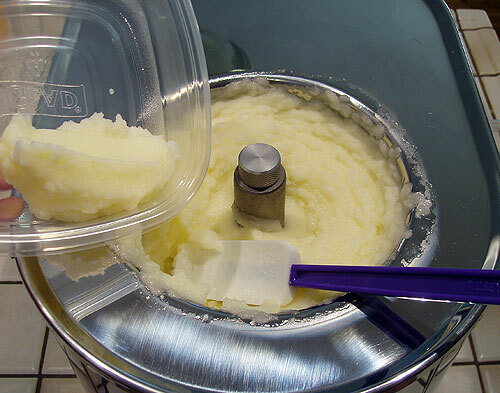 It was lighter than the other lemon sorbet recipe I make (which I still love for the powerful lemon flavor) and is more suited to pairing with other foods. This was rather fortuitous since I wanted to combine it with the blackberry sorbet. The two sorbets marbled together were just divine and I can’t help myself from having seconds every time I have it for dessert. For this batch I wandered off into the other room while the ice cream maker was running and when I came back it was more than ready. In fact, it was practically fluffy. My newer ice cream maker is more powerful than my old machine so it just plugged away rather than grinding and screeching when it was getting thick. Even with the limoncello I added, it was still fluffy—almost like snow. To remedy this texture I let the sorbet soften a little bit and worked with a spoon to smooth it out, returning it to a perfectly smooth texture. Unrelated, I am getting some pressure from a couple other bloggers, Lisa and Chris, to bring some chocolates to the next Lunch 2.0 event at Ning’s next week. Although warm weather conspired against me to make chocolate molds earlier last month, and various home improvement projects have strung me along through June, I still have 7 pounds of chocolate that I have to do something with. I’ve definitely been the oddball food blogger at past Lunch 2.0 events (it’s primarily tech-oriented), but it’s actually fun to say you are a food blogger when everyone else is geeking out. Nevertheless, it doesn’t seem to make me less of a geek. Apparently having any blog is pretty nerdy. 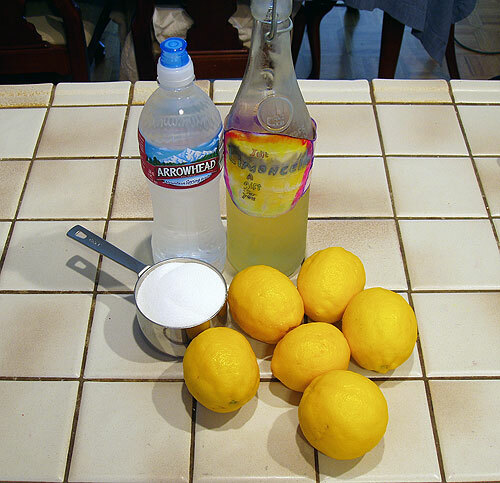 Ingredients for making Lemon Sorbet. 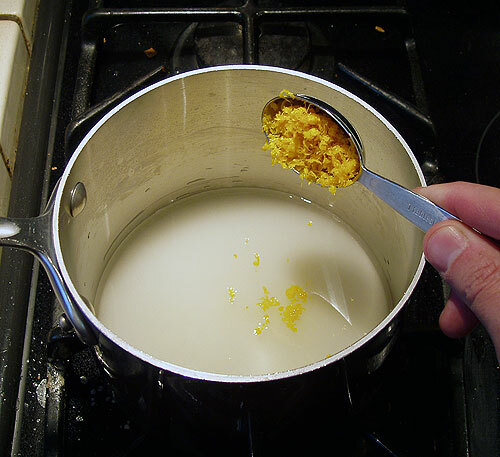 Add grated lemon zest to sugar and water. 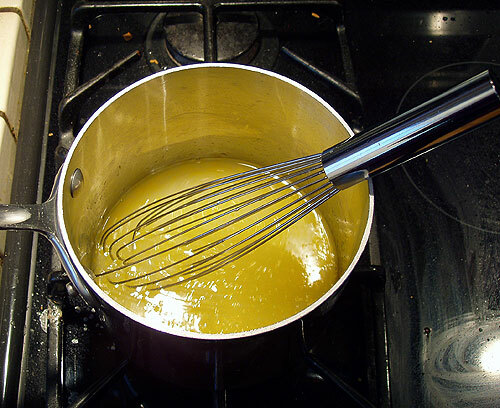 Heat mixture until sugar is dissolved. 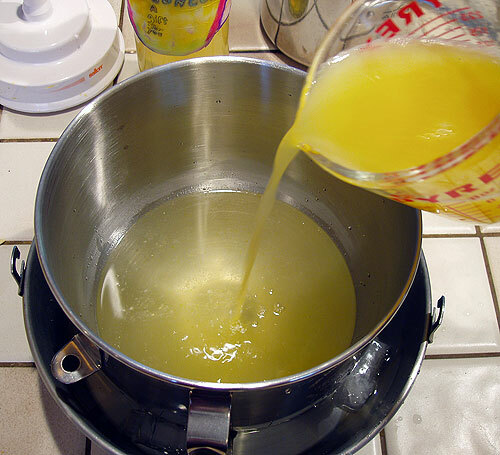 Add remaining water, lemon juice and limoncello to sugar syrup and chill in ice bath. 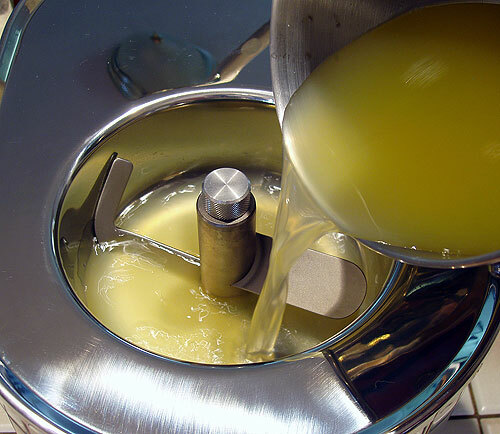 Transfer lemon sorbet to dedicated container to ripen in freezer for several hours. The recipe pictured above, with detailed instructions and complete photo gallery, can be found on the Lemon Sorbet recipe page. This entry was posted on Thursday, June 7th, 2007 at 10:11 pm	and is filed under Sorbets. You can follow any responses to this entry through the RSS 2.0 feed. You can leave a response, or trackback from your own site. 7 Lbs of chocolate that you don’t know what to do with? I’ll be right over. Beautiful sorbet, you always make me wanna try to make sorbet just once. Have you forgot to mention you’re a nerd by day, confectioner by night? you’re not following anyone my friend. Now that you’ve announced you’re bringing goodies to the next Lunch2.0 we need to figure out an ecommerce system, or maybe a donation system so I could buy a chocolate for someone else or something. 7 lbs of chocolate you have no idea what to make of it? Someone call the dessert police! I think that’s a crime. that video of Cookie Monster rocks! So. A tip jar tomorrow?